Western blot analysis of ATP Synthase beta on a Jurkat cell lysate. Lane 1: 1:10,000, Lane 2: 1:20,000, Lane 3: 1:40,000 dilution of the Mouse Anti- ATP Synthase beta antibody. 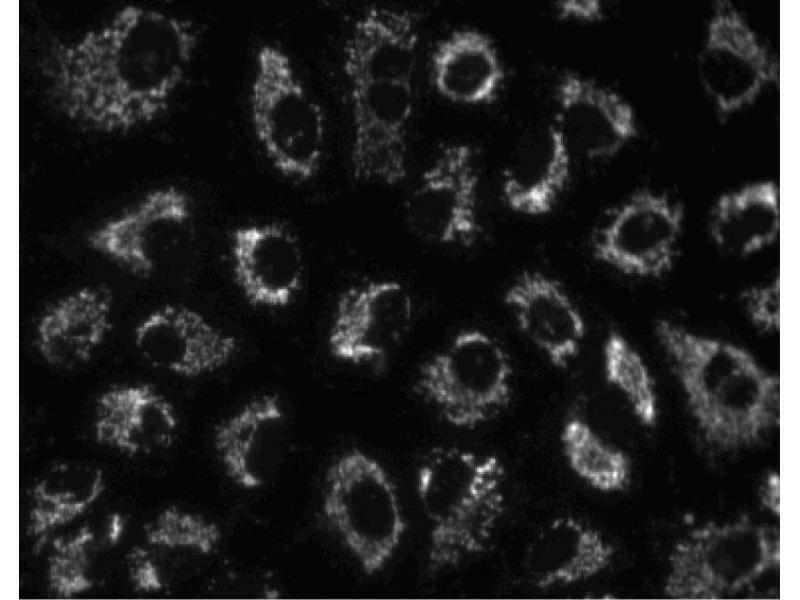 Immunofluorescent staining of A549 (ATCC CCL-185) cells. Cells were seeded in a 96 well imaging plate at ~10,000 cells per well. 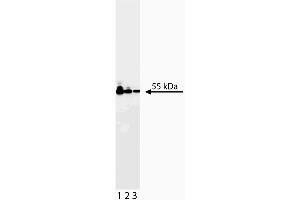 After overnight incubation, cells were stained using the alcohol perm protocol and the Mouse Anti- ATP Synthase beta antibody. The second step reagent was FITC goat anti- mouse Ig (Cat, No. 554001). The image was taken on a BD Pathway™ 855 bioimaging system using a 20x objective. 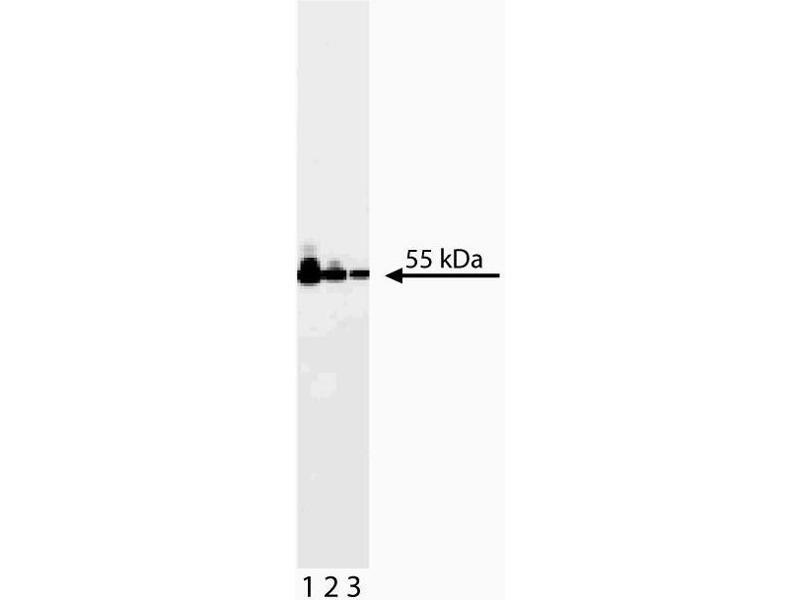 This antibody also stains HeLa (ATCC CCL-2) and U-2 OS (ATCC HTB-96) cells and can be used with either fix/perm protocol. Attributs du produit 1. Since applications vary, each investigator should titrate the reagent to obtain optimal results. 2. 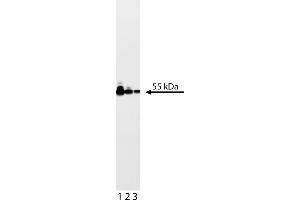 This antibody has been developed and certified for the bioimaging application. However, a routine bioimaging test is not performed on every lot. Researchers are encouraged to titrate the reagent for optimal performance. 3. Triton is a trademark of the Dow Chemical Company. 4. Source of all serum proteins is from USDA inspected abattoirs located in the United States. 5. Caution: Sodium azide yields highly toxic hydrazoic acid under acidic conditions. Dilute azide compounds in running water before discarding to avoid accumulation of potentially explosive deposits in plumbing. 6. Please refer to us for technical protocols. Sujet ATP synthase is a large enzyme complex that uses an electrochemical H+ or Na+ gradient to synthesize ATP from ADP and Pi, providing the organism with the ATP needed for energy. The complex consists of two major units, F0 and F1. F0 is embedded in the inner membrane of the mitochondria and, due to its hydrophobic nature, translocates protons across this membrane. F1 is the catalytic portion in the matrix region of the mitochondria and is comprised of alpha, beta, gamma, delta, and epsilon subunits at a 3:3:1:1:1 ratio. The beta subunit is synthesized in the nuclear genome,transported to the mitochondria, and assembled with the other subunits. It is encoded by a single copy gene, is ubiquitously expressed and highly conserved among species. ATP synthase beta contains an Ets domain binding site, which is a main site for promoter activity. Ets proteins contain domains that are involved in transcriptional activation, protein-protein interactions, and intramolecular repression of DNA binding. This site acts as a target for transcriptional control by the Ets family of transcription factors. Thus, ATP synthase beta is involved in the synthesis of ATP and is controlled in part by ETS family proteins. 1. Seed the cells in appropriate culture medium at ~10,000 cells per well in an 96-well Imaging Plate and culture overnight. 2. Remove the culture medium from the wells, and fix the cells by adding 100 myl of Fixation Buffer to each well. Incubate for 10 minutes at room temperature (RT). 3. Remove the fixative from the wells, and permeabilize the cells using either 90% methanol, or Triton™ X-100: a. Add 100 myl of -20°C 90% methanol to each well and incubate for 5 minutes at RT. OR b. Add 100 myl of 0.1% Triton™ X-100 to each well and incubate for 5 minutes at RT. 4. Remove the permeabilization buffer, and wash the wells twice with 100 myl of 1× PBS. 5. Remove the PBS, and block the cells by adding 100 myl of to each well. Incubate for 30 minutes at RT. 6. 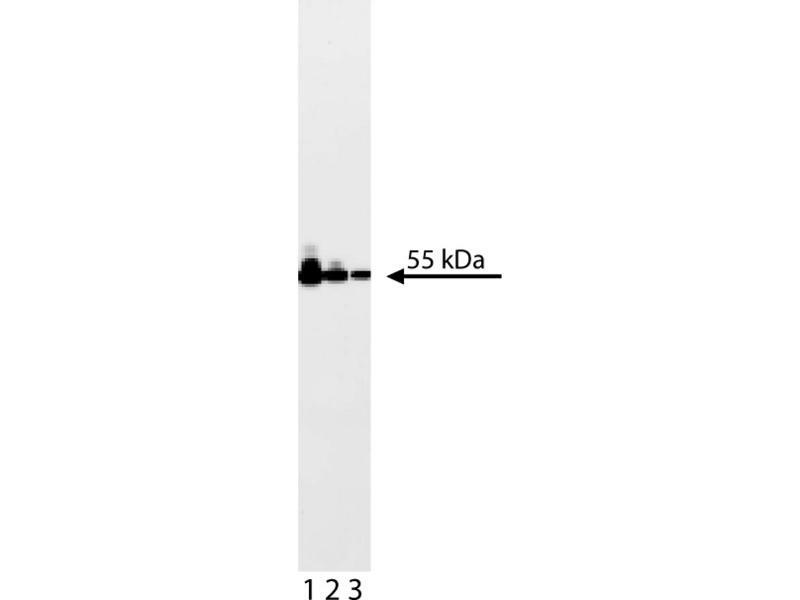 Remove the blocking buffer and add 50 myl of the optimally titrated primary antibody (diluted in Stain Buffer) to each well, and incubate for 1 hour at RT. 7. Remove the primary antibody, and wash the wells three times with 100 myl of 1× PBS. 8. Remove the PBS, and add the second step reagent at its optimally titrated concentration in 50 myl to each well, and incubate in the dark for 1 hour at RT. 9. Remove the second step reagent, and wash the wells three times with 100 myl of 1× PBS. 10. Remove the PBS, and counter-stain the nuclei by adding 200 myl per well of 2 myg/ml Hoechst 33342 in 1× PBS to each well at least 15 minutes before imaging. 11. 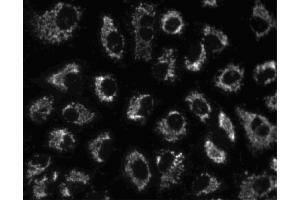 View and analyze the cells on an appropriate imaging instrument. Buffer Aqueous buffered solution containing BSA, glycerol, and ≤0.09 % sodium azide. Stockage commentaire Store undiluted at -20°C.